Kathleen Wade and Bill McLean look at her crushed mobile home. 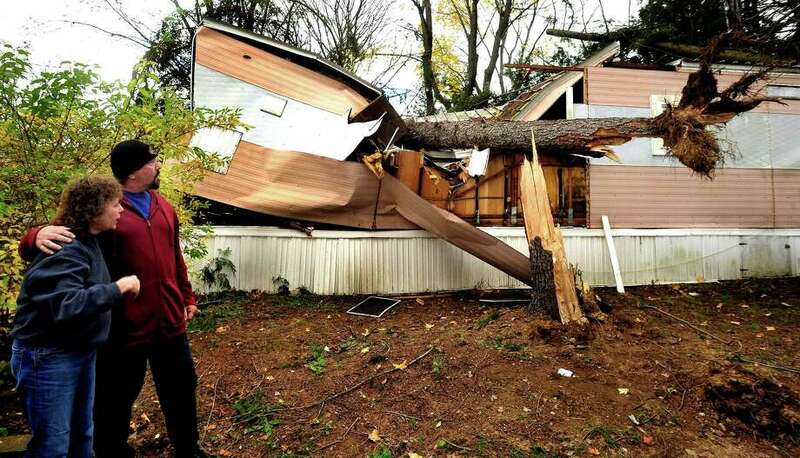 McLean pulled Wade from the home after two trees fell on it during Hurricane Sandy in Newtown. Photographed Friday, Nov. 2, 2012. Kathleen Wade stares into what was almost her coffin -- the crumpled remains of a tree-intruded, salmon-and-white, two-bedroom mobile home in Newtown. She can still hear the "vroom" just before a large pine tree was uprooted from across her narrow road and crashed through her roof next to where she was seated on the living room couch. Crushed between the tree and the wall, Wade said she feared her screams would go unheard over the roar of the wind. But Bill McLean, a neighbor, heard her screams. He raced over, with her son, Rich Hancock, right on his heels and spotted Wade's hand waving in the front window. "I opened the window, and we pulled her through," McLean said. "It was eerie. "As we pulled her out we heard the roof buckling," he said. "We wanted to get her out just as fast as we could." The uninsured house is a total loss, but Wade, who is unemployed, is glad to be alive and grateful for McLean's many acts of kindness. Not only did he help rescue her, but also he made hot chicken noodle soup for her.